Trip Description : For the combination of fantastic scenery above and below the water this tour is simply a must. While on the island of Koh Nang Yuan, relax and unwind by swimming, snorkeling or plain old fashioned sunbathing! Visit Koh Tao - one of the most scenic places for diving and snorkeling in the Gulf of Thailand. Period : 08.00 - 16.30 hrs. Koh Tao is also known as the turtle island as its shape resembles one. Koh Tao's little sister island, Koh Nangyuan is a private island that consists of three smaller islands connected together by a beautiful sandbank. Together, these islands form four bays with crystal-clear water, white sandy beaches and amazing coral reefs that offer optimal conditions for snorkelling.The Divers Temple and The Jewl of The Sea are just some of the names used to describe KohTao. Tao is a stuning work of art by nature. Come and join us for a full day cruise to this wonder. Tao Island is composed of 21 kms of rocks and coconut trees, surrounded by shallow beaches making a breathtaking panorama when sailing around the island. It is located 45 kms north of Samui and 40 kms east of Chumphon. On the west coast, the main town, is the residence of most of the local population. The small tropical island amid the deep blue sea is encircled by miles of coral reefs and pinnacles where you can find a wide array of tropical reef fish and some large, deep-water fishes such as mantas and whale sharks.Tao Island is considered the best diving and snorkeling location on the Thai sea. Our guides will take you to the best locations where you will meet schools of tropical fish and marine flora. We can all so offer you complete diving gear and diving guide. Snorkel dive or bask in the sun Koh Tao is a fantasy come true. All tours include breakfast soft drink, lunch, snorkeling gear, hotel transfer and guide. (Our tour-guide speak English) In case you are a vegetarian please let us know before and we will prepare special food for you. Check - in at the pier and enjoy your continental breakfast. 09:00 hrs Board speed boat to Koh Tao which means Turtle island in Thai. Apart from its turtle-shape, it does in fact play host to sea turtles who every year crawl up the beaches to lay their eggs in the sand. 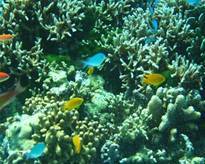 Koh Tao is an up and coming dive center which gain an influx of tourists. 10:00 hrs Arrive at Ao Muang (Mango Bay, KohTao) for snorkeling, sightseeing the beautiful beach. 12:00 hrs Have lunch at Bingo restaurant in Koh Tao. 13:00 hrs Depart from restaurant to "Koh Nang yuan" and you can relax with beautiful corals by snorkeling which we call "Crystal Clear" or sightseeing ,climbing up the view point to make a memory. 15:00 hrs Depart from Koh Nangyuan to Koh Samui. 16:30 hrs Arrive at Koh Samui. Transfer back to hotel.